Home Cricket IPL 2018 IPL AUCTION team India IPL 2018: Steve Smith more successful as captain than Virat Kohli, MS Dhoni? IPL 2018: Steve Smith more successful as captain than Virat Kohli, MS Dhoni? On Tuesday, Boards of Control for Cricket in India (BCCI) announced the dates for the auction. The stage is all set for auctions for the 11th edition of the Indian Premier League. The mega-auction for the IPL 2018 auction is scheduled to be held in Bengaluru on January 27 and 28, the Press Trust of India reported on Tuesday (December 19). The dates for the auction coincide with the South Africa-India Test at the Wanderers in Johannesburg as well as the final of the Syed Mushtaq Ali domestic T20 tournament. So as per the common myth, former Chennai Super Kings skipper MS Dhoni is believed to be the most successful captain in the T20 league. 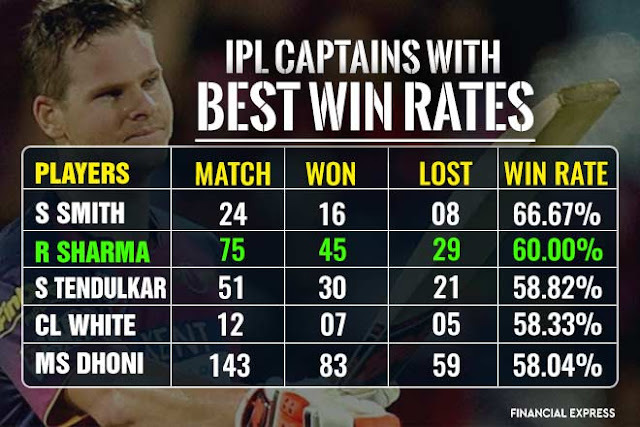 However, in reality, Rising Pune Supergiants captain and ‘Don Bradman’ of the 21st century Steve Smith has a better win rate than that of even Dhoni. Smith tops the table with 16 wins in 24 games at a win rate of 66.67 percent. Second to Smith is Mumbai Indians captain Rohit Sharma. He has 45 wins in 75 games at a win percentage of 60 percent. Interestingly, third is on the list is the legendary Indian batsman Sachin Tendulkar. Tendulkar’s has 30 wins from 51 games at a percentage of 58.82. Virat Kohli is not even on list! Dhoni finds a place on the fifth spot behind Australian Cameron White. On one hand, where White has seven wins from 12 games at a rate of 58.33 percent, on the other hand, Dhoni has 83 wins from 143 games at 58.04 percent. This year’s auction will see teams having an increased budget of Rs 80 crore from previous Rs 66 crore. In all five players can be retained by a franchise, which includes two Right to Match cards. Meanwhile, BCCI is seeking approval from the television. Broadcasters Star India to change the timing of the match game from 8 pm to 7 pm. The 8 pm start has often seen the matches continue well past midnight, thus causing a problem to the fans at the stadium and to parents of kids at home, watching on television. It was in the IPL general council meeting that the chairman Rajeev Shukla pitched the idea of an early start. The idea was welcomed by the franchises, but the last call is the broadcasters. Nonetheless, the GC meeting saw the approval of another change in the format of the tournament. Starting from this tournament, teams will be afforded a mid-tournament transfer window. However, there is a catch. Only players who have featured in two games out of seven would be eligible for the move. “It was just a thought (starting game at 7 pm) and everyone welcomed it but first we need to speak to the broadcaster and take their nod. We will work on modalities then. There have been many centers where traveling is a major concern. All the issues were discussed and we all thought to start the game but early,” IPL chairman Rajeev Shukla said.